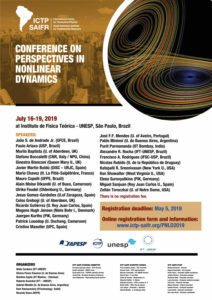 The Conference Perspectives in Nonlinear Dynamics PNLD 2019 will be held between 16 and 19 July 2019 at ICTP-SAIFR, São Paulo, Brazil. PNLD 2019 will be a satellite to STATPHYS 27 which is being held from 8-12 July 2019 in Buenos Aires, Argentina in the preceding week. The PNLD series of meetings have been held as satellites to the STATPHYS conferences since 2004, and thus this will be the fifth in the series. Our main aim in having this meeting in São Paulo would be to focus on the open issues in Nonlinear science and to identify the directions in which the field is evolving. A second aim of the meeting is to bring together physicists working in the region and across the developing world.